Are you looking for a quick and easy way to make chopped eggs for salads? Our Electric Pressure Cooker Hard Boiled Eggs (No-Peel) are a great way to make chopped eggs without having to peel them! Pour 1 cup of water into the bottom of a 6 to 6.5 electric pressure cooker. Place the metal trivet in the bottom of your pot. Grease a 2 to 2.5 quart oven safe bowl VERY well and place on top of the trivet. Carefully crack and add 8 eggs to the greased bowl, keeping yolks from breaking. Seal the lid and cook under high pressure for 5 minutes and let the electric pressure cooker release pressure naturally for 5-7 minutes before quick releasing. Run a rubber spatula around the edge of the eggs to loosen them from the side of the bowl. Carefully, remove the bowl from the pot (it will be VERY hot) and turn it out onto a cutting board. Use oven mitts as the bowl will be hot. Chop the eggs to desired consistency and use in recipes or top on salads. This is our Electric Pressure Cooker method. 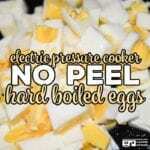 If you are looking for the slow cooker method see: Crock Pot No-Peel Eggs. The trick to this method in both the crock pot and electric pressure cooker is an oven safe bowl (or tall sided pan) that you place on the metal trivet that comes with your electric pressure cooker. We have tested this recipe in our 6.5 quart Ninja Foodi, our 6 quart Instant Pot and our 6 quart Crock Pot Express. You can find more electric pressure cooker recipes with our Recipe Finder. As with any of our recipes, carb counts, calorie counts and nutritional information varies greatly. As a result, your nutritional content depends on which products you choose to use when cooking this dish. Finally, all electric pressure cookers cook differently, so cooking times are always a basic guideline. Recipes should always be tested first in your own electric pressure cooker and time adjusted as needed.